Despite a dire weather forecast a good crowd of members gathered at Rackham to look at the ditches and wet grassland of The Hales, the eastern end of Amberley Wild Brooks. This interesting area was in the 1990s one of the most species-rich parts of the Wild Brooks: the northern ditches cross peaty ground adjacent to the acid Lower Greensand but calcareous water flows in from the south and supports additional species. Although cattle were present, the meadows and ditch margins were in general under-grazed, so some species known here were either not found or were scarce. Nonetheless, we saw a fair collection of the plants for which this area is known. Aquatics included the now uncommon introduction E. canadensis (Canadian Waterweed). 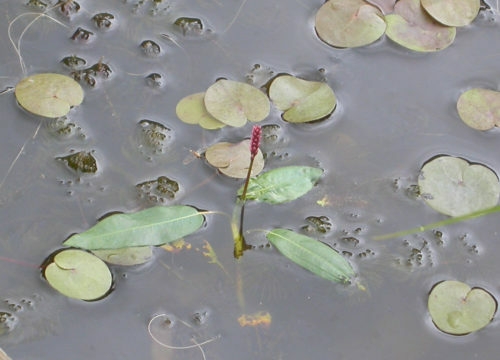 Hydrocharis morsus-ranae (Frogbit) and Sagittaria sagittifolia (Arrowhead) were in flower. Potamogeton acutifolius (Sharp-leaved Pondweed) is remarkably indifferent to water quality at Amberley and flourishes along the Greatham parish boundary in the heavily iron-stained water of Smith’s Ditch, accompanied by P. natans (Broad-leaved Pondweed) and P. trichoides (Hairlike Pondweed). Several sedges were in evidence, including Carex vesicaria (Bladder Sedge) and C. rostrata (Bottle Sedge). Both Sparganium erectum (Branched Bur-reed) and the less common S. emersum (Unbranched Bur-reed) grew with Glyceria maxima (Reed Sweet-grass), Lythrum salicaria (Purple Loosestrife) and other taller species along the channel sides. The rare Leersia oryzoides (Cut-grass) is the star of the show along ditch margins and is plentiful by Smith’s Ditch. Almost the entire UK population occurs in the Arun catchment from Amberley up to Plaistow and Horsham. We saw numerous spikes of its glossy pale yellow flowers: formerly considered a shy flowerer, it seems to come out more often of late – this year in July, a full month earlier than normal. 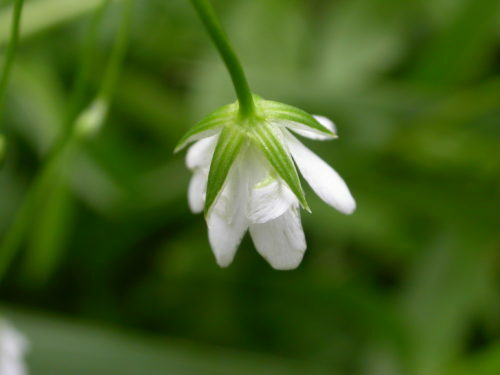 Before we were finally defeated by torrential rain we managed to see a number of plants of the uncommon Stellaria palustris (Marsh Stitchwort), for which this may now be the best part of the Wild Brooks. 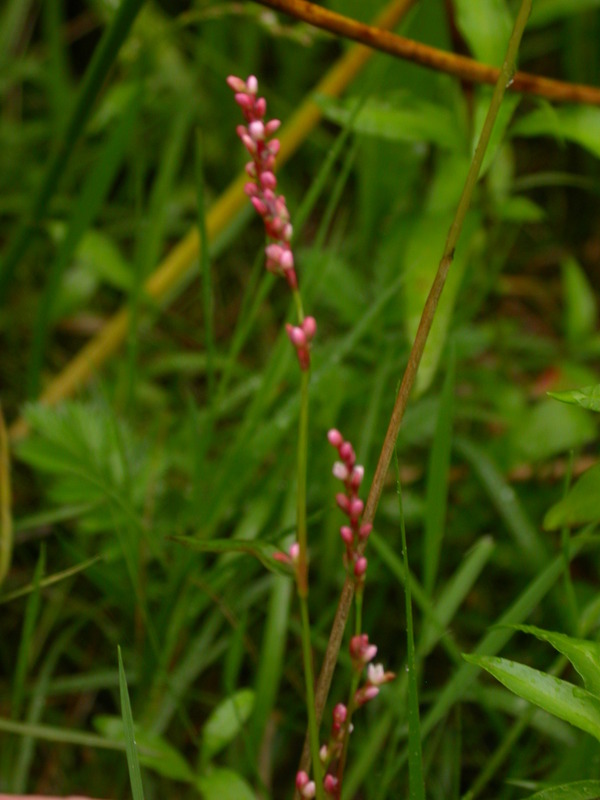 After much searching a little Persicaria minor (Small Water-pepper) was found in one of the few patches of well-grazed marginal vegetation on the bank of Smith’s Ditch. So, although we were only on the Brooks for a short time and explored only a few hundred metres of ditch, our efforts were not wasted. But it was a hunched and dripping party which shambled back to the cars. We gratefully thank the RSPB for kind permission to visit this part of their Amberley Reserve.